In a 360 degree live stream video, Google I/O 2016 keynote was full of new announcements and cool stuff that will take Android to the next level. New services, apps, hardware, features and improvements that will be all part of Android N.
There were loads of really nice announcements that made me go WOOHOO and some that I could really care less about, but overall I think Google is doing pretty good this year. My biggest surprise would be not announcing the official name of Android N, Google decided to leave that job to the public by asking them to vote on the next new name of Android, I’m very much rooting for Nutella here and I won’t deny it. After so many failures (and I really do mean so many: Google Talk, Google+, Google Hangouts), Google decided to hit the reset button on messaging and video and create all new apps that is Android and iOS compatible. Google Allo will be the latest attempt to enter the messaging arena with new features that looks really interesting, mainly you’ll be able to use “Incognito mode” ot keep your conversations private even from Google. You’ll also be able to use Google’s search assistance within the app itself, saving you time to do searches within your conversations instead of using another app. Google Due is the new video conferencing app that Google promises to be super efficient on slow networks. One of the coolest features that it has (called Knock Knock) is that you would be able to view live feed of the person calling you, giving you the chance to see what kind of conversation you’ll be getting yourself into before answering. It is end to end encrypted and it works based on your phone number instead of login IDs (WOOHOO!). We’re already impressed by the capabilities of Google Now, but that didn’t stop Google from ever trying to improve the heart of their voice search engine. Instead of just throwing commands, now you can have (real?) conversations with Google to make things happen. If that was not enough, They aimed even higher and created an always listening device to decorate your room and help you without the need to have your phone with you. 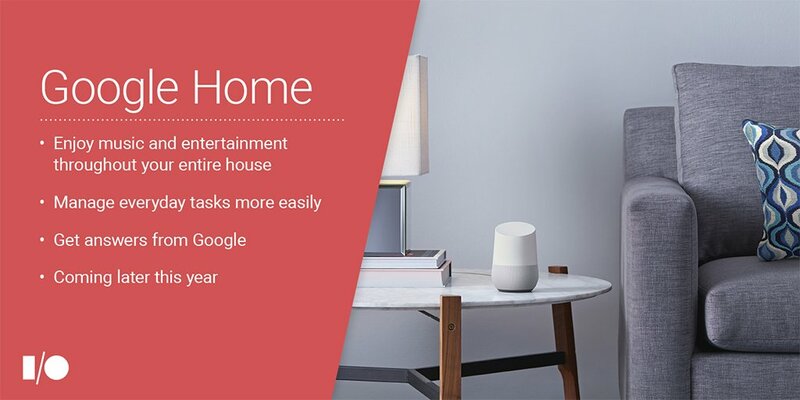 Google Home, which is a speaker, is the direct competitor of Amazon Echo. It operates using Google Assistant and it can do really neat stuff. It can be connected to your TV, lights and all sort of entertaining systems at home, allowing you to control of that using voice commands. I wonder if half of what it can do will be able to work outside the US though. There has been a lot of confirmed features coming our way the last couple of months, specifically after using the new Android Beta Program which allows you to install and test drive the new version of Android, but this was the first time that Google announced those features in a keynote. Performance: Google is now introducing the Volcun API into Android to allow developers to create visually stunning games (Need for Speed does look really good). The Volcun API will give direct access to the phone GPU resources without sacrificing performance. Other areas of improvement include better battery consumption using a new aggressive version of Dose. A new JIT compiler will boost performance between 30 and 600 percent, this will also make apps 75% faster to install and use 50% less space, nice! Security: Updates are now upfront on the matter, previously installing them was a pain (get notification, download, restart, wait, wait, wait…) but now Google addressed this problem with a seamless update mechanism which downloads the updates silently and applies them the next time the phone is restarted. The greatest gain here is that the lengthy message “Optimizing Apps” that appear after installing updates are now gone (WOOHOO!). You’ll also get File level encryption for protecting user profiles. Productivity: We asked for it, and we got it. Multitasking split screens and picture-in-picture viewing are now a reality and are happening in Android N, a feature that was only available by custom OEM development like Samsung and LG. Quick Switching between last two apps is also a new feature activated by tapping the recent apps button twice, this will be useful specially for phones with small screens and working with multiple apps. A new Clear All button was also introduced to close all recently used apps instead of closing apps one by one. The app notification has seen some improvement too by giving you the ability to interact with notifications without opening the respective app, we can now also choose how notifications are being handled by deciding to completely block them or show them silently. And oh, Android is the first OS to support Unicode 9, messaging will be a lot more entertaining. Instead of downloading an app to use a small feature or open a link with it, Google is now pushing into a different direction to make things easier for the masses. One of the coolest features announced is Google Instant Apps. It basically allows you to use applications without fully installing them on your phone. So if you click a link to something that links to an app, Android will run the link without installing the full application, it will only download the required pieces of the app and run it in the background. The good news is that this features is compatible all the way back with Android Jellybean 4.1. VR (Virtual Reality) is the hottest topic after mobiles, and everyone is trying to get a piece of that pie. Google is playing it smart. Along side launching their own hardware controller and VR goggles, they’re lunching a VR platform called DayDream with a set of APIs and standards into Android N. This will allow software developers and hardware manufacturers to dip into the VR platform easily. 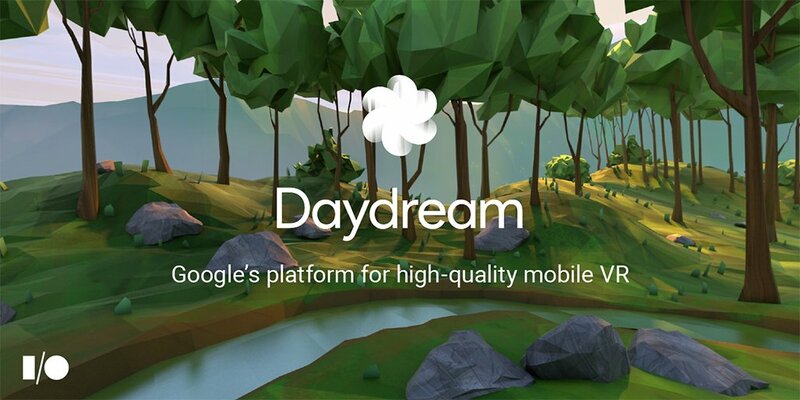 We heard a lot names already working with Google on DayDream. Samsung, LG, Huawei and HTC are all in, big software companies like EA and Ubisoft are also onboard too. I admit I have never been into the wearable technology frenzy everyone is going through, but I believe that we’re getting there anytime soon, Google is working hard to make that time come sooner than later by releasing Android Wear Developer Preview 2.0 with lots of new enhancements. For starters, Android Wear apps can run in a standalone mode by accessing the internet directly over Bluetooth, Wi-Fi, or cellular without relying on your phone. New features also include full keyboard (yup, I don’t get it too) and handwriting recognition to allow easier use of the watch.